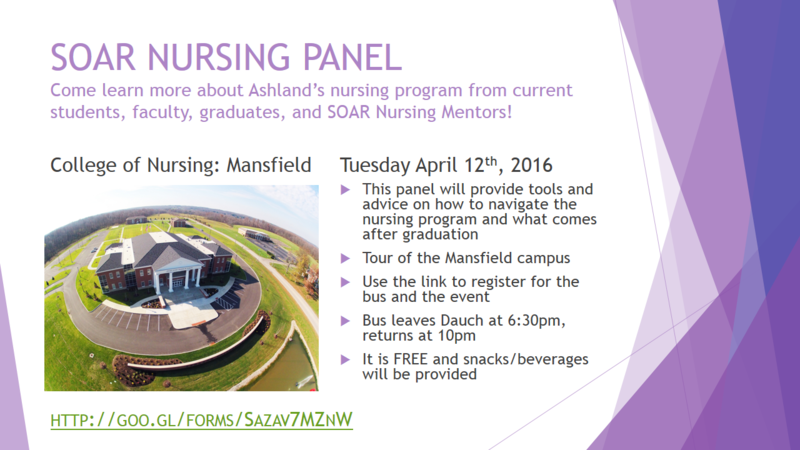 Come learn more about Ashland’s nursing program from current students, faculty, graduates, and SOAR Nursing Mentors! This panel will provide tools and advice on how to navigate the nursing program and what comes after graduation. There will be a tour of the Mansfield campus for those who are interested. Snacks/beverages will be provided. Transportation is available from the Ashland campus - a bus will leave from the Dauch College of Business and Economics at 6:30 pm and return by 10 pm. Please complete this form to register for the bus.